Click here to read the section on Potter Row. Potter Row is a string of houses that follow a lane to the north-east of Great Missenden. They stand in open farmland, in the Chilterns and above the Misbourne Valley. Pottery finds show that there has been human settlement there since the Bronze Age. Today it includes 16th and 17th-century farmhouses, labourers’ cottages linked to the pottery industry – there since the middle ages – and, alongside these, houses built by the Victorian watercolour artist William Callow and design pioneer Arthur Lazenby Liberty, of Liberty's store in London. Taken together, these are the essential elements of the Chilterns – the reason why these hills are designated an Area of Outstanding Natural Beauty, a heritage asset of nationally recognised environmental and historic value. Potter Row, therefore, represents the whole. An 1898 map of Potter Row with the HS2 line superimposed. 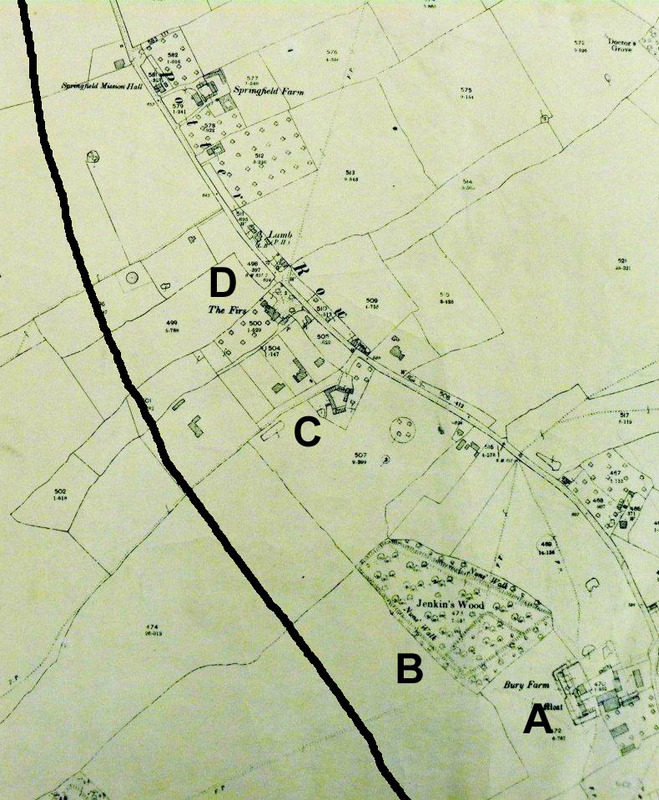 The letters A-D identify significant historic buildings and earthworks. And it is proposed that the HS2 high-speed rail line should run across the hillside on a line parallel to Potter Row, never more than 200 metres from the lane and sometimes within 50 metres of historic buildings and earthworks. No surprise, then, that this Impact Assessment concludes that the historic landscape of Potter Row will be inevitably and irrevocably damaged, and its long-term heritage value lost, if the HS2 proposals go ahead in their present form.